Prestige watch retailers are often asked for advice on which watches to buy as investments. Their answer, drilled into them from one generation of shopkeepers to the next, is that people should buy the watches they love, not the ones expected to rise in value. That remains the best advice, despite prices rising sharply in recent years. However, more refined advice for customers could be that they should buy the watches they love, and invest instead in a top end booze cabinet. 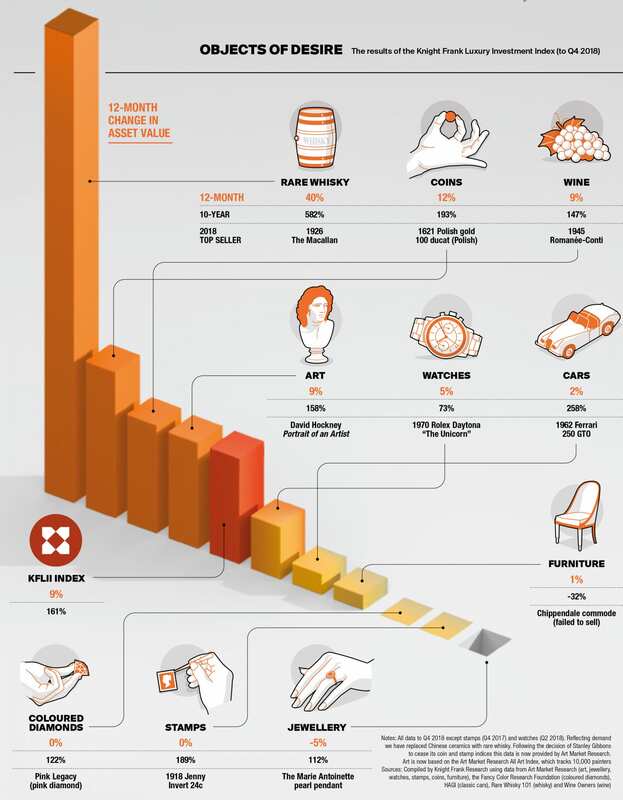 Research out this week shows that soaring prices on the secondary market for Submariners, Daytonas, Nautiluses and Royal Oaks are not enough to make luxury watches as lucrative an asset class as fine Scotch Whiskey and rare French wine. In the 2019 Franck Knight Wealth Report, and its subsidiary report the Luxury Investment Index, researchers look at the luxuries that the ultra-rich tend to collect, and study how quickly prices are rising at the top end of the market. Luxury watches have done well over the past 10 years, increasing in value by 73% over the past decade, and 5% in 2018, according to the Knight Frank Luxury Investment Index. However, this rise pales in comparison to other collectibles. Rare whiskey increased in value by 582% since 2008 and by 40% last year. Coins were up 12% last year, while wine and art both rose by 9%. Last year was a transformational one for rare single malt Scotch whisky. One bottle set a new world record of £700,000 in October, only to be beaten a month later by one that sold for £1 million before the buyer’s premium. Both were bottles of The Macallan distilled in 1926. 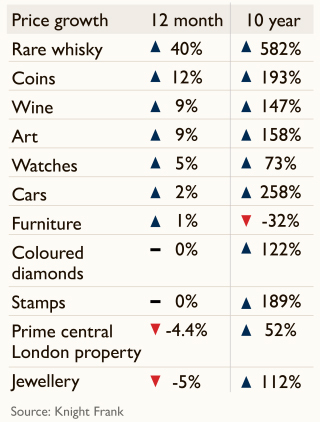 Values for certain old vintage rarities soared past previous records, achieving almost unimaginable new auction highs. On the wine front, 2018 saw further rapid price escalation for Burgundies, notably top Grands Crus from the “Rs” (Raveneau, Romanée-Conti, Roumier and Rousseau), driving Knight Frank’s Burgundy index up 33%. Sotheby’s October sale saw a single bottle of La Romanée-Conti 1945 fetch US$558,000 – somewhat higher than its upper estimate of US$32,000! The sale highlighted the potential premium the market is prepared to pay for impeccable provenance.